Home » Entertainment » Apple to launch a new credit card with Goldman. Are the perks worth it? Apple to launch a new credit card with Goldman. Are the perks worth it? NEW YORK (Reuters) – Apple Inc said on Monday it will launch a credit card with Goldman Sachs Group Inc this summer that can be used to earn cash back on the purchase of Apple products, but analysts suggest its rewards do not stand out among rivals. The Apple Card will sync with iPhone’s users’ Apple Wallet and work through its payment system Apple Pay, said Jennifer Bailey, vice president of Apple Pay. She spoke in Cupertino, California, where the company also announced the launch of a streaming television service and an online gaming arcade. Cardholders will earn 2 percent cash back on all purchases made using their phones or 3 percent cash back on Apple products. The physical credit card will be made of titanium – laser-etched with users’ names but no numbers as a security feature. It will pay 1 percent cash back on purchases. The card, which will be issued by Goldman Sachs Group Inc and will use the Mastercard Inc network, will come with new features in the Apple Wallet to help users track their spending with a breakdown of monthly purchasing. Credit card industry analysts said the rewards programs were not significantly different from what is currently available in the market, but that Apple’s broad consumer reach could make it a major player. He noted that the rewards for Apple’s card were less attractive than benefits Citigroup Inc offers with its Double Cash Card. The U.S. Bank Altitude Reserve Visa Infinite card gives 3 points per dollar on mobile wallet spending, worth 3 percent cash back or 4.5 percent off travel, he added. Apple Pay is accepted by 70 percent of U.S. merchants and will be available in more than 40 countries by the end of the year. Commuters in New York, Chicago and Portland, Oregon, will eventually be able to use it to pay for public transportation, Apple said. Cash back rewards will be credited to Apple Pay users’ accounts on a daily basis, Bailey said, and the card will not charge annual fees, international fees or late fees. She did not give specific information on the interest rate cardholders will pay on balances. Sara Rathner, credit card specialist at financial product comparison site NerdWallet, said there are “a lot of cash-back cards that offer similar benefits” but that the card would be convenient for consumers who purchase a lot of Apple products and services. Tim Devaney, of free credit score app Credit Karma, said the rewards are competitive but are not what will differentiate the Apple Card. 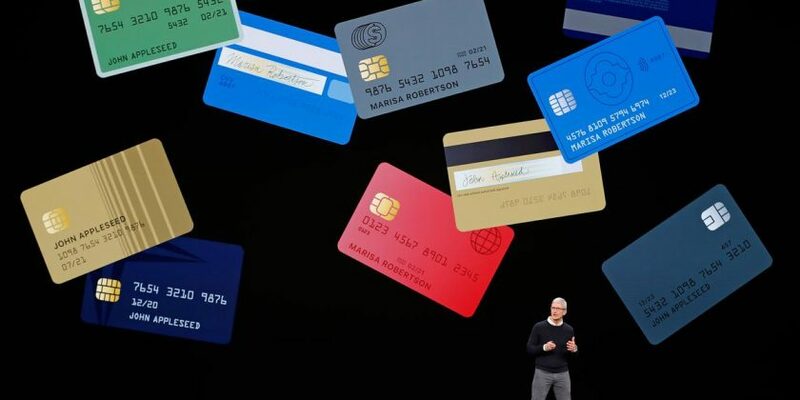 “The Apple Card is consumer-friendly,” he said, noting features such as a calculator that shows how much interest a consumer will incur by paying a balance over time. Apple did not say if the new budgeting tool would include cash and credit balances from other accounts, nor if it would come with a sign-up bonus. The Apple Card is Goldman’s first credit card. The Wall Street investment bank has been offering more products to consumers, including personal loans and savings accounts through its Marcus online bank. Apple’s Bailey said Goldman will never share or sell consumer data to third parties for marketing. She added that the card would have privacy features, and Apple would not know what and where a purchase was made or how much it cost.